Looks like a good idea. It would obviously need the USB to Serial components, which may defeat the purpose I guess. There are no PICAXE boards like that, nor any boards which have a direct USB interface on them, which we produce. The main obstacle to having such a board is they, as you suggest, would need to include the USB-to-Serial interfaces on them and that would make the cost of boards prohibitive. It is somewhat of a good idea, but as Hippy said, the cost to produce outweighs the benefit. You can effectively achieve the same thing using an AXE027 USB to 3.5mm Download Cable and an AXE029 Breadboard Adaptor. Yes this does include a lead (which you wanted to avoid) but unless you had a perfect match (height wise) between USB Port position and the breadboard, then you are very likely to put a great deal of pressure on the USB Port and its contacts. The lead gives plently on flexibility and strain relief. I maybe so bold as to suggest a hack. take a AXE027, either shorten the lead or solder correctly directly to the board of you desire, then hot glue to two together. While on the face of thing this looks like a great idea, unless your computer is on the desk you have some USB extension to the desk (which defeats the no cable idea) its going to be a pain to do much development work with it down near the floor. A project like this is certainly doable for someone who wants a direct plug-in PICAXE module. As hippy intimates, not commercially viable. Mount an FTDI SMD on one side of the board and an SMD 08M2 on the other. Where there's a will there's a way. It reminds me of the "14X2" module that I made for a particular purpose several years ago, when we only had the 256-byte 14M. That's incredible... there's a Chinese Ebay seller offering ATTINY85 boards for USD$1.50! 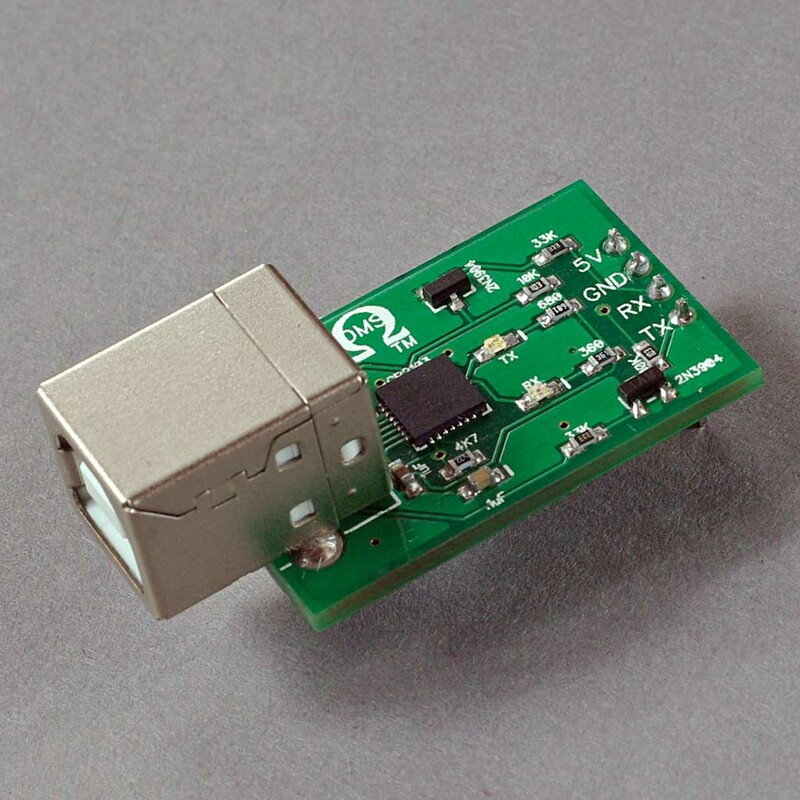 There's another cheap ATTINY dev board with USB adapter and 8-pin DIP socket. An 08M2 sure would look great plugged in there, but it wouldn't do too much. Mod Edited (hippy) : There's no problem in mentioning them but we're not giving them free advertising on the forum. I"m still waiting for the day that the Picaxe will be powered and programmed through the same USB cable. Why wait? Just make your own cable as Goeytex showed with a dollar CP2102 usb dongle and inverter. You have 5V and ground pins right there. Erco, I tried using a CP2102 and an inverter chip, but I couldn't get it to work on windows. It was OK on linux machines though. Might be the drivers used by win7 for this chipset since it didn't actually prompt me to install drivers. Mikey, please share more details! Looks like a CP2103 with some 2N3904 NPNs to invert the signals. I can share out the project on OshPark if anyone is interested in having the PCB made. Yes, interested. Would you be willing to post the eagle files here? I would get 10 of them from jclpcb next time I order from them. Very nice. Would be even nicer with a 5v to 3.3v regulator to up the 3.3v current capability. I didn’t want to post links since this could be considered a Picaxe competitor. My buddy & I purchased a half dozen of these when we first came across Picaxe chips back in 2014(?). I think we got them via ebay. The reason we chose these was that they would plug into a breadboard as we wanted to play with the new (to us) Picaxe chips. The +5v supplied onboard comes from the USB port it’s plugged into so I don’t usually try pulling over a couple hundred milliamps (I always put a 1/4A picofuse on the breadboard in case I screw up). All the Picaxe CPU boards we have designed have an 8-pin female connector, so the U2P also plugs into them. Our CPU boards have a jumper that allows using USB power or external voltage (usually +12v) for the +5v bus. If I were going to make one of these from scratch, I would add a CTS line so the M2 chips (no background receive) could be spoon fed from a PC or Pi. RTS line might also be useful. Could be a (forgive me) Arduino-style board such as the “FTDI Friend” could be mounted on a board with a LM339 to flip the signals. Hope you find something that suits you & good luck. Thanks for the details Mikey. Unfortunately, they don't seem to be available at the moment. Erco, I tried using a CP2102 and an inverter chip, but I couldn't get it to work on windows. Thanks for the update Erco! I guess I will have to test again. Are you using a specific eBay seller for the modules? Lance, I can't find the Eagle files for that one. They're probably on my old shop computer before I made the switch to using OneDrive. If i get a chance this weekend, I'll look for it. I can probably redo it to remove the load switch and add a 3.3V regulator instead. No, just whoever's cheapest. Pic attached of the ones I made to use in my classes. I prefer this white-screened PCB with the diagonal SMT IC since its output pins mostly line up with the 74HC14N inverter pins and require the least soldering. Simple enough to fabricate on a scrap of perfboard. BTW, CH340 USB adapters work equally well and are often cheaper than CP210x adapters (CP2012 and CP2014 both work here). Don't worry about it--I wouldn't spend too much time searching. Found an earlier version of it (v1.3) but evidently I decided to change v1.4 to use a female micro USB connector and overwrote the version I had OSHpark make... That was about 5 years ago so who knows what i was thinking. haha But should be easy to change the early version to use a 3.3V regulator. The 3.3V 500mA LDO I picked is a TLV755P available in SOT23-5 footprint. All resistors and capacitors are 0805 so fairly easy to solder. Resistor values are in the silk screen, consult schematic attached or FTDI datasheet for capacitor values (page 22). The fuse on the back is size 1210, 500mA. Ferrite bead is 0805, e.g., MI0805K601R-10. Use the gerbers attached so the silkscreen is clean. You'll need to install FTDI's FT_Prog app to setup the FT230XS after soldering to invert RX and TX, set CBUS pins to light the correct LEDs. FT_Prog is very intuitive and easy to use. 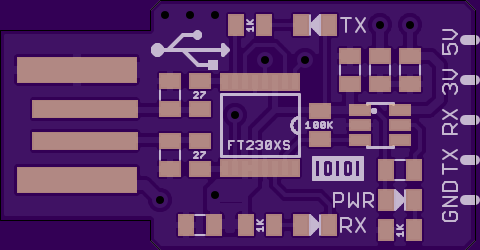 Edit: Updated design to make ground plane around USB- and regulator more robust; adjust RX & TX LEDs to be easier to distinguish; added names of all components to silkscreen.